Prepare your favorites in this attractive set of cookware pots and pans! 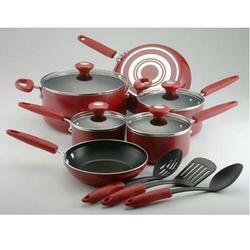 A nice assortment of red non-stick fry pans, saucepans, and dutch oven for preparing delicious meals for family and friends in this Farberware Silverstone 13-Piece Cookware Set. Non stick coating Provides an attractive black lining and ease of cleaning in this stove top cookware. Nylon tools Are safe to use in coated pans. Black lids Add touch of contrast to red set of cookware. Nice variety of pans Offers flexibility for recipes with differing cooking requirements, pan sizes, and preparing several dishes at the same time.